Extracurricular Activities : Dance and Music. Sports: Kabaddi and Cricket. Competitions on District level in Speech, Writing, Arts, Question-Answer, Music. Majgaon is a small village with an elevation of 1465 m located at 7 km from Thalisain on the Thalisain-Nainital Road. The closest temple is in Thalisain and is called Hanseshwar Mahadev Mandir. Omkarananda Saraswati Academy, Majgaon, has a quiet environment as it is a lone single storey building situated in the middle of a terrace field in a valley. The small Purvi River is two terrace-steps away in front of the School. 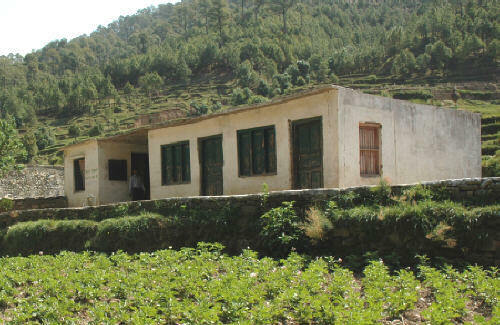 The School has been founded in 1998 and runs Nursery Classes to Classes V. It serves the children coming from four nearby villages within a radius of 3 km. 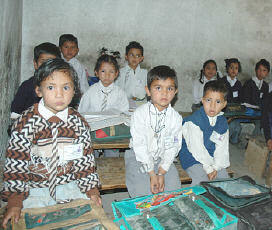 In addition to the formal syllabus, the children are also taught Garhwali and Hindi songs and dances. They also keenly participate in Speech, Writing, Arts and Music competitions on District level. In sports, they play Kabaddi, Cricket and compete in High-jump and Long-jump.